This program provides step by step instruction for using Kurzweil 3000. The viewer will learn strategies to support individuals with learning and reading challenges through the myriad of specialized features offered by Kurzweil 3000. These features include scanning printed material, reading scanned text aloud, reading the Web and offering flexible and practical study skill tools. Arjan Khalsa reviews Intellitools supplemental reading and writing programs which are not only research based and designed for universal access but also enjoyable and motivating for all primary age students. Specifically this presentation provides the viewer with an overview of IntelliTools software programs: Reading: Balanced Literacy; Ready Made Primary Writing; and Ready Made Primary Literacy. Peggy Dalton, Director of Professional Services, �If I can�t read the question, how am I going to answer it?� Millions of students struggle with reading as well as how to convey their knowledge through writing. WYNN: �What You Need Now� is a PC scan and read software developed to offer an option for these students. This seminar specifically reviews the user friendly features of WYNN, including its capabilities to access print files, electronic text and internet for students with reading and writing challenges. The seminar shows participants how to customize WYNN for individual students; as well as how to use WYNN for enhancing reading writing and studying skills. Boardmaker is a practical software program used to create communication displays. This presentation provides a step by step tutorial for using Boardmaker - Macintosh. 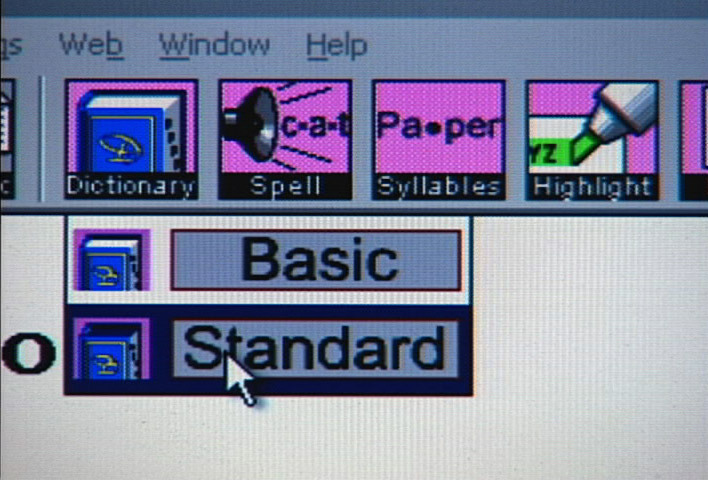 During this program the viewer will learn how to launch Boardmaker as well as become familiar with special features of the program including "draw window" and "symbol finder". The viewer will also be shown how to create and modify a custom board as well as how to use templates provided by the software. This is an excellent program for Boardmaker beginners, who are using MacIntosh. Boardmaker is a practical software program used to create communication displays. This presentation provides a step by step tutorial for using Boardmaker for Windows version 5.0. During this program the viewer will learn how to launch Boardmaker as well as become familiar with special features of the program including "draw window";"symbol finder"; and the new feature of "categories". The viewer will also be shown how to create and modify a custom board as well as how to use templates provided by the software. This is an excellent program for Boardmaker beginners, who are using Windows version 5.0. Write:OutLoud is a powerful reading and writing tool which assists students who struggle with these academic tasks by reading on screen text aloud. Bob Keller, a representative of Don Johnston Incorporated, provides an overview of the features and uses of Write:OutLoud, including read-as-you-type features, highlighting options, and speech controls. Bob then demonstrates the process of scanning hard copy text into the program to be read aloud and offers ideas for practical uses in the classroom. Kelly Fonner and Bob Keller provide an introduction to Alphasmart 3000, a popular portable word processor. Writing strategies and modifications for students with disabilities are presented for use with the Alphasmart. The presentation also reviews software applications, called applets, that can enhance the Alphasmart 3000�s word processing functions. Co:Writer applet, which is a word prediction program, is specifically reviewed. Arjan Khalsa provides an overview of math instructional software for students with disabilities using Intellitools programs: IntelliMathics, ReadyMade Fractions, Number Concepts, MathPad Plus, and Early Math. The presentation clearly demonstrates how each of these programs utilize virtual math manipulatives to assist and motivate students with disabilities in learning number concepts, computation, patterns, fractions, geometry and probability.